Dectomax Pour-On for Cattle is a highly active broad spectrum parasiticide for topical administration to cattle. It contains doramectin, a novel fermentation-derived compound discovered by Pfizer. Doramectin is isolated from fermentation of selected strains derived from the soil organism Streptomyces avermitilis. A primary mode of action of doramectin is to modulate chloride ion channel activity in the nervous system of nematodes and arthropods. Doramectin binds to receptors that increase membrane permeability to chloride ions. This inhibits the electrical activity of nerve cells in nematodes and muscle cells in arthropods and causes paralysis and death of the parasites. In mammals the neuronal receptors to which doramectin binds are localised within the central nervous system (CNS), a site reached by only negligible concentrations of doramectin. Broad-spectrum: a single treatment with Dectomax Pour-On for Cattle effectively treats and controls a wide range of internal roundworms and arthropod parasites that impair the health and productivity of cattle. Long-action: the sustained drug concentrations that result from its unique pharmacokinetics enable the product to protect cattle against parasite infection and reinfection for extended periods following treatment. Safety: Dectomax Pour-On for Cattle has a wide margin of safety in all classes of cattle. Its broad spectrum of activity, favourable pharmacokinetics and exceptional toleration make it an ideal product for application as an antiparasitic for cattle. To obtain optimal benefit from the long-action of Dectomax Pour on for cattle, it is recommended that cattle which are set-stocked should be treated at turnout and eight weeks later. 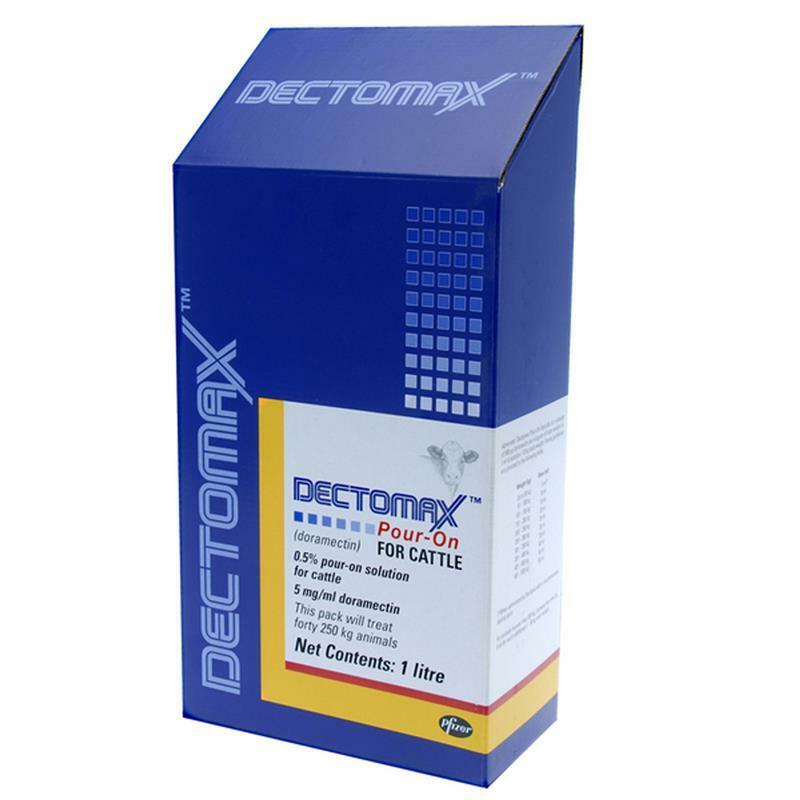 Used in this way Dectomax Pour-on for cattle will reduce the build-up of infective larvae on pasture and protect such animals from parasitic gastro-enteritis and parasitic bronchitis throughout the grazing season. Dosage: 1 ml per 10 kg bodyweight. Administration: Dectomax Pour-On should be applied topically along the mid-line of the back in a narrow strip between the withers and tail head. Do not use in lactating cows used to produce milk for human consumption, or in dry cows or pregnant dairy heifers within 60 days prior to calving.